Oysters were extremely popular in the Georgian era and, selling for remarkably low prices, were enjoyed by people at all levels of society. The unknown ladies behind our Cookbook certainly had a taste for them – we’ve seen them serve oysters in soups, bake them in bread rolls and add them to pies in their hundreds. Take an hundred of large oysters unopened, save all their own liquor. Pick out all splinters from them. Put them in a stew pan with an anchovy shred, half a nutmegg grated, a few blades of mace, half a pint of white wine. Sett to stew on ye fire slowly till ye oysters are done. Then, take half a pint of sweet cream that has been first boyld & is cold. Put in to a lump of butter roll’d in flowere. Toss these up with y oysters, shakeing them well untill ye flower is not raw. Let them get a boyle or two together. Take care it is not burnd. [Serve] them with white bread sippits toas[t]ed under them. Oysters today are considered a delicacy and the reserve of the rich. Back in the 18th century however, they were served up liberally and savoured by all levels of society. London’s many shellfish shops often offered an ‘oyster room’ where their wares could be sampled on site, and oyster-men did the rounds of the city’s theatres and public houses, selling produce from the oyster-beds of the Kent and Essex coasts. The shores of the Thames are still littered with oyster shells, discarded by Georgian Londoners at a time when the shellfish were considered fast, cheap food. Whitstable is a fishing town that has that supplied the London markets for centuries. This weekend, hosts of Londoners will be making the journey over to Whitstable harbour for the start of the town’s annual Oyster Festival. It seems a fitting occasion to explore a couple of oyster dishes from The Cookbook of Unknown Ladies. The recipes below each call for a hundred oysters, making them expensive dishes by today’s standards! While our unknown ladies’ oyster loaves recipe sees each crusty roll stuffed with 16 of the shellfish, Paul Hollywood’s modern version on the BBC website is scaled down to suit 21st century wallets. 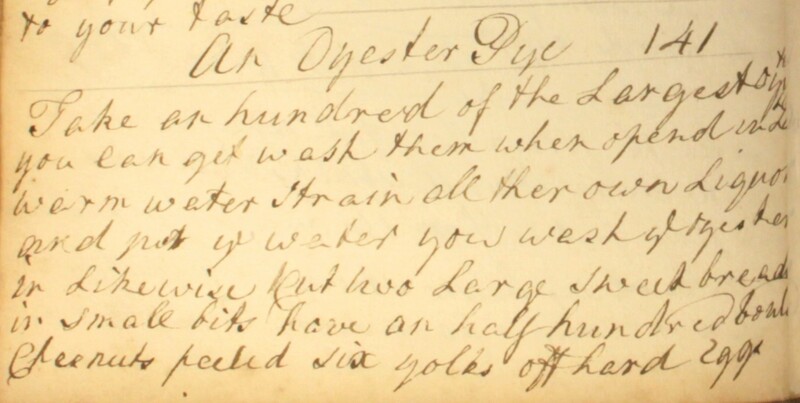 This 18th century recipe for oyster loaves calls for 100 oysters! Take half a dozen of French roules, cut of the top of the crust about the breadth of a shilling piece and scoop out all the crum and be sure not to breake the crust. 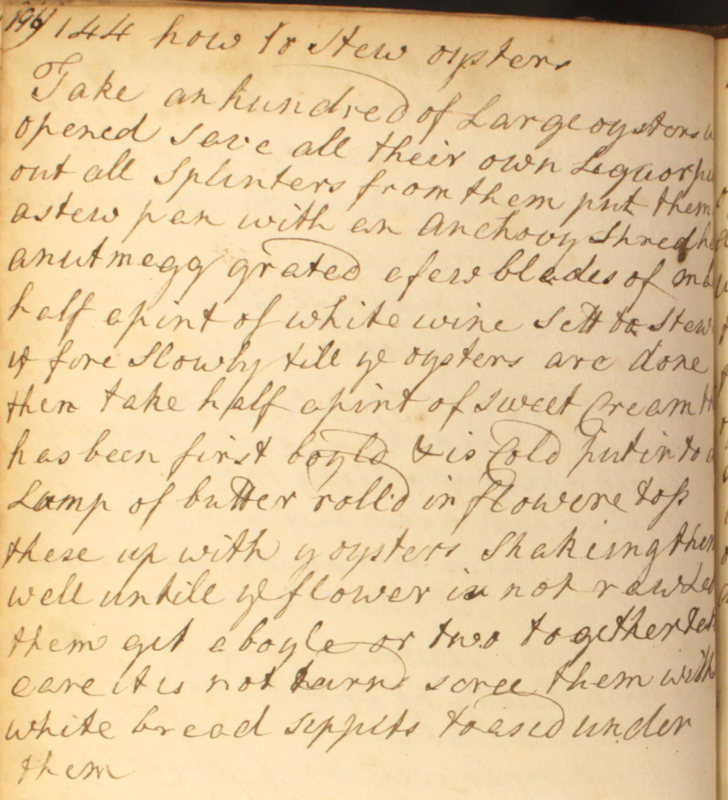 Then take a hundred of oysters, open them and wash them very well in […] their own liquor. Then take the oysters and some crums of bread and two spoonfulls of their own liquor and a bout half a pint of white wine. Take some mace and cloves and a little nutmeg and pound them in a morter and put all these in your sause pan and stir them all together. 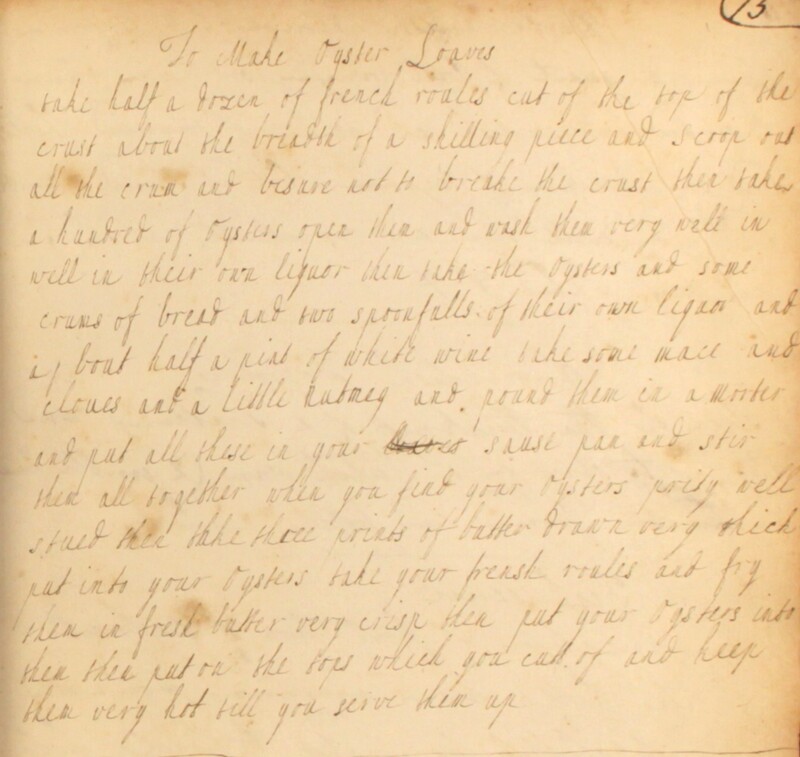 When you find your oysters prity well stued, then take three prints of butter drawn very thick, put into your oysters. Take your Frensh roules and fry them in fresh butter, very crisp. Then put your oysters into them. Then put on the tops which you cutt of and keep them very hot till you serve them up. Take an hundred of the largest oysters you can get. Wash them, when opend, in […] warm water. Strain all ther own liquor and put ye water yow wash ye oysters in likewise. Cut two large sweet breads in small bits. Have an half hundred bouled chesnuts peeled, six yolks off hard eggs, two anchovys shred, some lumps of whole marrow. Intermix all these in ye pye. Pour on ye liquor & a water glass full of white wine. Fill ye pye with what liquor it wants, with greawy. If you have not marrow, put in butter. Seasone it with salt, mace and cloves. Oysters, crab and lobster are the stars of this rich stew, which is based on a thick broth of mutton and veal. Take a neck of mutton & a nuckle of veal. Put them over the fire and make some strong broath with a bunch of time, 2 whole onyons & a little whole pepper. Then take all the fish out of 6 lobsters & as many crabs and put it in the strong broath & let them stew one hour over a slow fire with a pint of clarret. 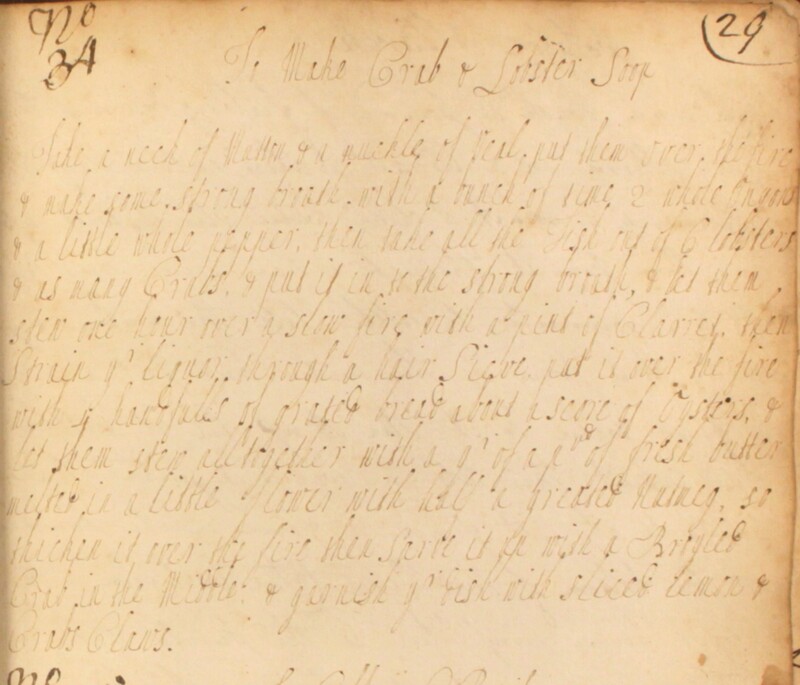 Then, strain yr liquor through a hair sieve, put it over the fire with 4 handfulls of grated bread, about a score of oysters & let them stew all together with a qr of a pnd of fresh butter melted in a little flower, with half a greated nutmeg. So thicken it over the fire then serve it up with a broyled crab in the middle & garnish yr dish with sliced lemon and crabs claws. Lobsters fished from British waters could be bought more cheaply in the 18th century than they are today, and oysters were also used liberally in the Georgian kitchen. Mutton and oysters were a celebrated combination of the period. Several Georgian cookery books include a recipe for roast mutton, in which oysters are stuffed into slits in the meat before cooking.